When you visit our Scotts Valley dental office, your smile is our top priority. Dr. John Stevens and his entire team are dedicated to providing you with the personalized, quality dental care that you deserve. Our Philosophy is to treat every patient with personalized care. We believe that the dentist and the patient together should be responsible for their oral health. We offer convenient office hours, Monday through Friday. Our office is supplied with with state of the art equipment. We have a clean, friendly environment. We meet or exceed American Dental Association Standards. We accept most dental insurance and will help process the claim forms. My Team and I have now been practicing here in Scotts Valley for over eighteen years. I have been voted FAVE (favorite dentist) by the readers of the Scotts Valley/San Lorenzo Press Banner for a fourth year in a row! Thank you to all my loyal patients for their vote, support and referrals, which allows us to continue to provide outstanding service to the nicest dental patients in Santa Cruz County. Here is a brief overview of why you should choose me as your dentist. My practice continues to be upgraded with a number of enhancements and I'd like to share the great news with you. First and best, I've now increased the number of hours available to you, my patients, for you to schedule your ongoing maintenance of your teeth and gums. We alter our weekly schedule so we offer appointments both on Mondays and Fridays for those who prefer those days Schedule more easily than ever with either of my caring registered dental hygienists, Sandy Stobbe or Jan Netto. As of June, 2018 we welcomed Dr. Kevin Ma to our practice. He is an experienced dentist who grew up in Scotts Valley. He attended dental school at Western University in Southern California. He can provide care in all aspects of dentistry. He is currently accepting new patients! Then there are the high tech diagnostic and treatment modalities I've invested in for your convenience and comfort. Imagine, same day CEREC E max all ceramic crowns and fillings, intraoral imaging and highly diagnostic, ultra low dose X rays. We offer two different types of professional dental whitening (bleaching) for your convenience. We have answers for your concerns regarding snoring and sleep apnea. We offer Invisalign, the clear, sanitary alternative to braces. We have the entertaining and informative CAESY patient education system to help answer your questions about dental problems, solutions, and options. It's all here! 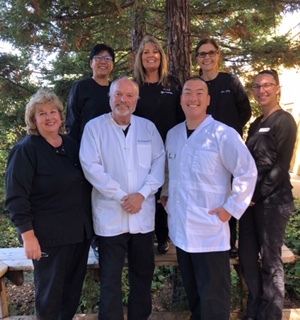 Scotts Valley dentist, Dr. John A. Stevens is dedicated to general, family, and cosmetic dentistry with services including Invisalign, CEREC 1 day crowns, dental implants, Lumineers Porcelain Veneers and more. Please call our dentist in Scotts Valley, CA to schedule your next appointment.